This cake is perfect. I think it’s going to be the cake that I serve whenever I need to pull out a breathtaking dessert at the end of a meal. And only when plums are perfectly in season, like right now for those of us in Ontario. 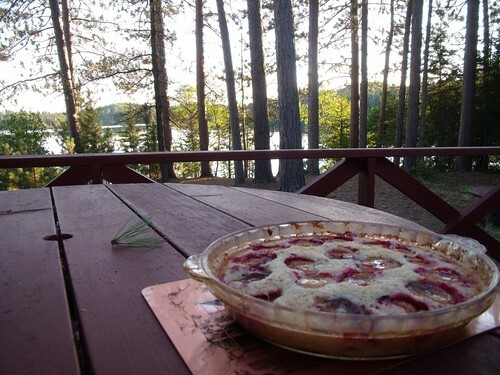 As you can see, I enjoyed this cake up at the cottage (all cake must taste better when the scenery looks like this!) and it was a hit with everyone there, including two kids under ten. Although, somehow, the cake got renamed “Bum Cake” when the kids were involved, and you know how sticky these nicknames can be! 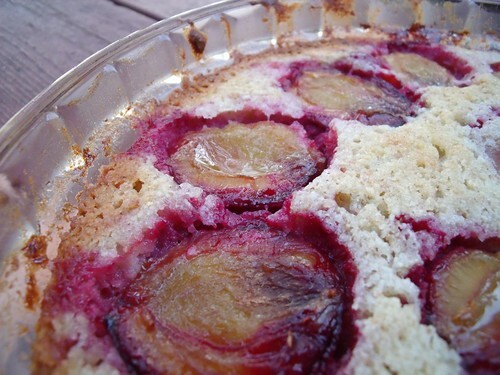 The halved plums look so very pretty atop this cake – I knew after something similar that I had at my friend Louise‘s place last year (Dorie Greenspan’s Dimply Plum Cake) that any plums I found this year were bound for a cake. And this almond cake is a perfect pairing with the small, blue plums around here (known as Italian plums, prune plums, or blue plums) and a whack of lemon zest for a sunshiny flavour! 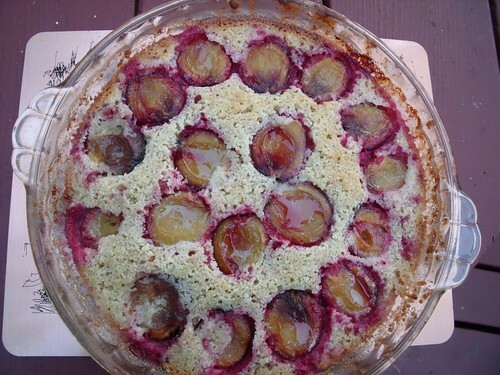 Feel free to use whatever plums you have on hand, and decorate the top of the cake as you will. These blue plums turned into magenta orbs of sweet, caramelized delight once baked in the oven. They even stained the surrounding bits of cake hot-pink, and flavoured it with their sweet-tart juices. And cake leftovers for breakfast? Oh yes. Preheat oven to 350F, and grease a 9″ round baking dish. In a large bowl, whisk egg whites and sugar for 2 minutes. In a separate bowl, combine almond meal and whole wheat flour. Add to egg white & sugar mixture, and whisk until well combined. Add melted butter, cinnamon, and lemon zest. Stir until all ingredients are incorporated. 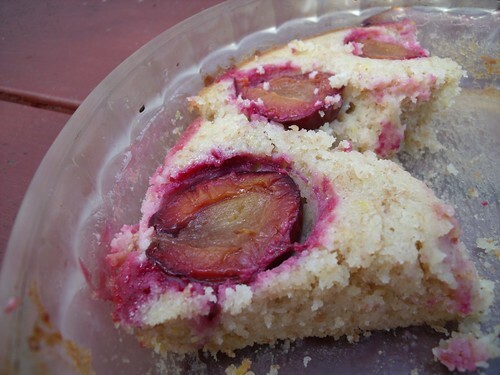 Pour batter into the greased baking dish, and stud with plums, cut side up. Bake at 350F for 35-40 minutes, or until the top is a lovely golden brown. My mouth is watering so much right now. It looks so beautiful, and I am imagining how wonderful it must taste. Thanks for sharing something that uses plums, one of my favorite fruits. I MUST try this one! You’ll love it, Ms Lins!!!! I made two of these last week as after the first one I couldn’t think of a better way to use up the plums!!!! Waw!! 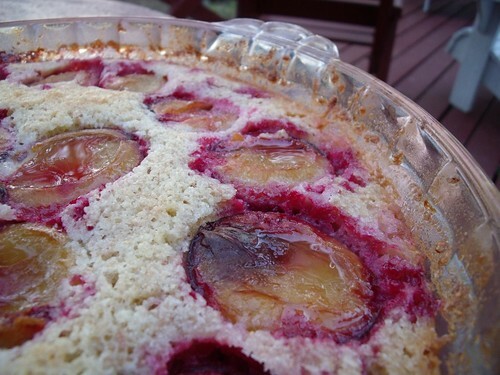 This GF plum cake looks so vibrant & awesome too! MMMMMMMM,…another must make of yours, Lindsay! How are you girl? I haven’t seen you @ my blog for quite a while! Your plum cakes looks very moreish, I just love how the magenta colour haz oozed to the surface. This “bum” cake was so yummy! You truly are a master (mistress?) of the kitchen, Lindsay!